When you're a kid, it's obvious that the best kind of truck is the Tonka you used to transport your GI Joes in back to their subterranean lair after raiding your sister's dollhouse. As an adult, though, you learn it's... duh, still the Tonka, but food trucks are a close second, and these are the sweetest ones in the ATL. You've gotta respect any establishment that uses the hashtag #tacolove -- especially when every bite confirms it. 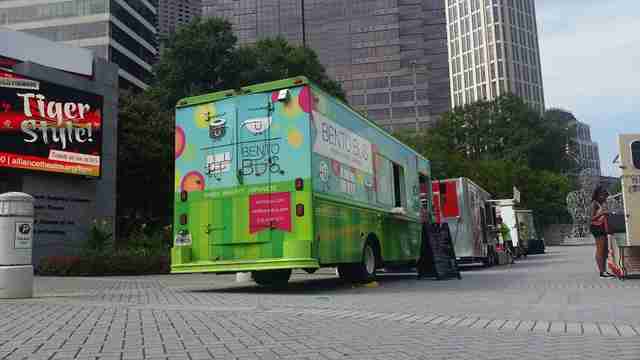 That’s surely why they’ve been awarded “Best Food Truck in Atlanta” five times. Their Mexican meets Asian infused eats are addictive and include burritos, quesadillas, tacos, and sliders. Standout dishes include sesame fries, the Asian rib-eye beef taco, and delectable pulled pork sliders. Owner/cook Will Turner proves what has been widely suspected: the only way to make Mexican or soul food better is to combine them. His “Mexican soul food” is relished across the city, and when you try Turner’s best creations, like the collard green quesadillas, pulled pork tacos, or BBQ steak tacos, you’ll be a believer, too. When it comes to food, the words fast, fresh, and high quality don’t always combine -- good thing Mix’D UP foods doesn't have that problem. Here, freshly made burgers are huge in both size and taste, so you get a ton of flavor (and meat). 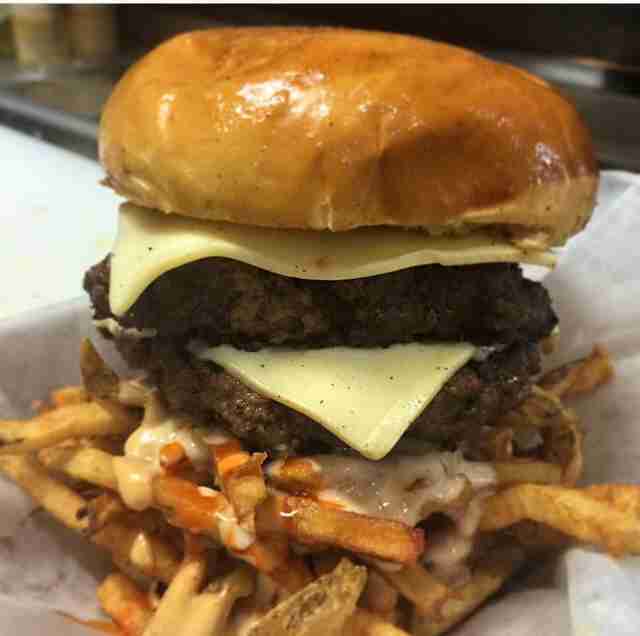 Try the Pile, an Angus burger served atop cheesy, perfectly spiced Buffalo fries. Pro tip: grab an extra handful of napkins; you’ll need them. 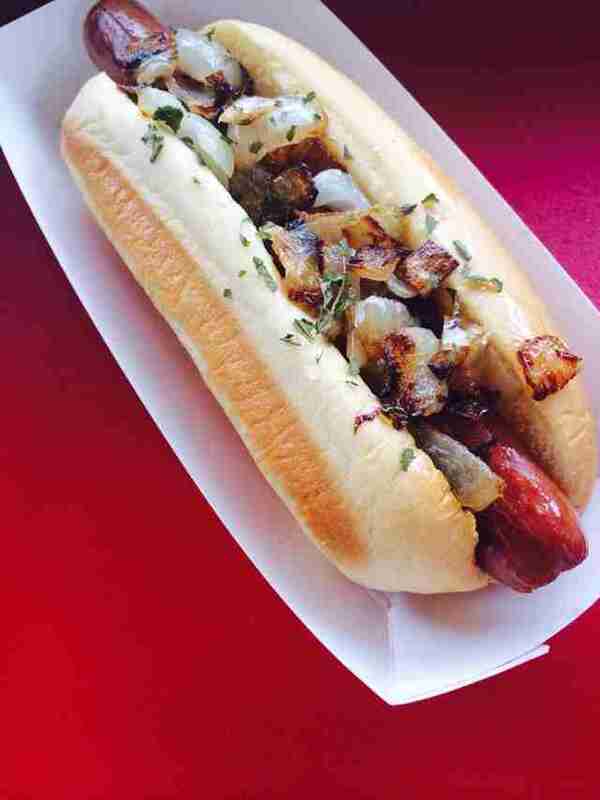 Chances are, you’ve seen their retro hotdog cart around town, and if you haven’t gorged yourself on their big, juicy, chargrilled 100% all-beef dogs yet, then make that a late resolution that you will actually enjoy keeping. 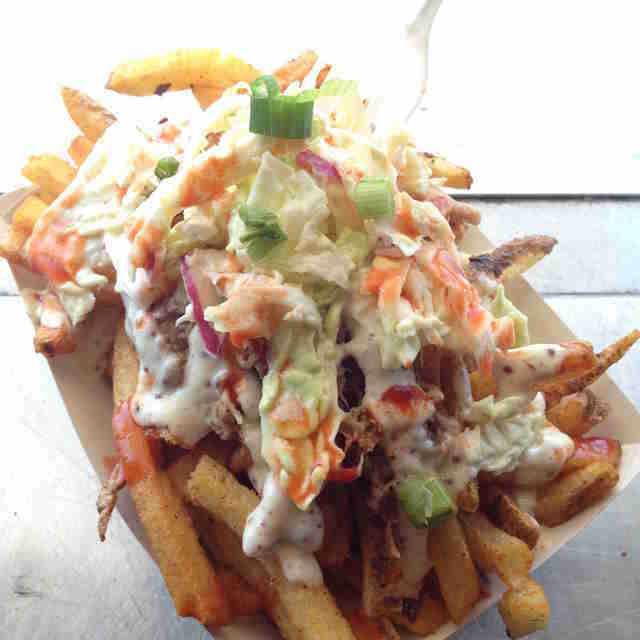 This truck makes meat discs inspired by the City's various 'hoods, including the appropriately slaw-topped Cabbage Town that also comes with pulled pork & prime Brasstown beef, so it's definitely worth spending some lettuce on. 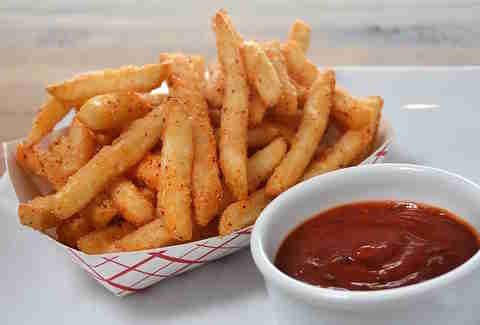 What’s the only thing that could possibly make french fries more delicious? Toppings. The Fry Guy’s range from simple (red curry ketchup and honey Sriracha mayo) to sophisticated (white truffle oil and coriander smoked salmon), all of which are quite literally finger licking good. 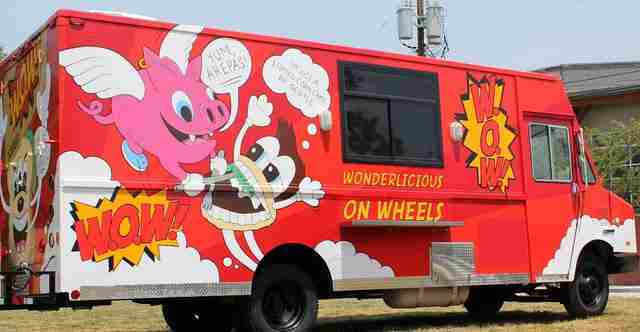 This anime-emblazoned food truck knocks out some seriously good Japanese eats, including these ribs that're marinated in Japanese barbecue sauce, served over white rice & sautéed mixed veggies, and are quite possibly the reason Wetnaps are still in business. The menu is small, but the flavors -- and portions -- are huge. 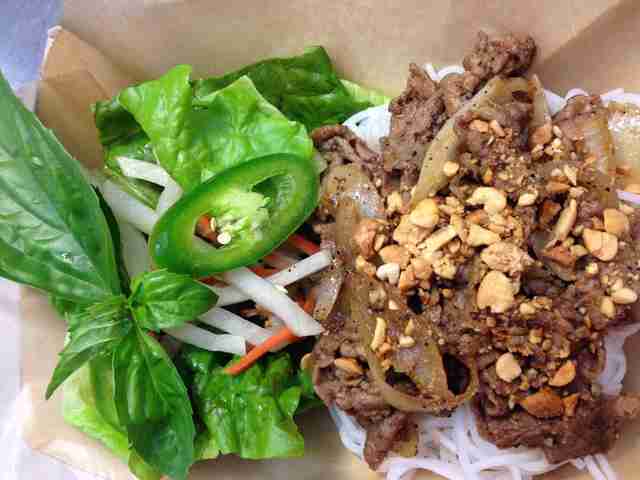 Owner Nomie is Vietnamese but was raised in the American South, so her dishes are authentic yet much different than the rest of Atlanta's Vietnamese spots. The shaken beef, bursting with melt-in-your-mouth meaty goodness is the play here. The Pickle serves up Mex, Southern, and bayou specialties without a speck of pretense. In addition to their friendly service and reasonable prices, most ATLiens typically sum up their love for The Pickle in three little words: Cajun Chicken Eggrolls. While the arepas (Venezuelan savory griddled corn cakes stuffed with slow roasted meats) are enough on their own to garner a cult following, WOW! Food Truck also serves up delicious and substantial bowls. Their WOW! Factor Bowl features a bed of creamy stone ground cheese grits drowning under a blanket of smoky BBQ sauce, chipotle cream, and luscious 20-hour smoked pulled pork. If you can manage to not savagely lick your take out container after eating, you’ve got more willpower than us. If the bacon-/ two pieces of fried chicken-/ hot sauce-topped waffle that is the "Papa G's" isn't quite enough for you, there's always the Bananas Foster-topped "Auntie P's", which is also what your uncle told a young you when asked why they have separate beds. An ingeniously delicious blend of Japanese and Mexican street food, the fare at Bento Buss is also healthy -- though it’s so incredibly tasty, it’s not the first thing you think. Their rice bowls are great, but the surrito (sushi + burrito) is fire. A sesame seed-studded tortilla is stuffed with rice, bits of seaweed, avocado, meat, and their signature special sauce is worth any waiting in line you encounter. 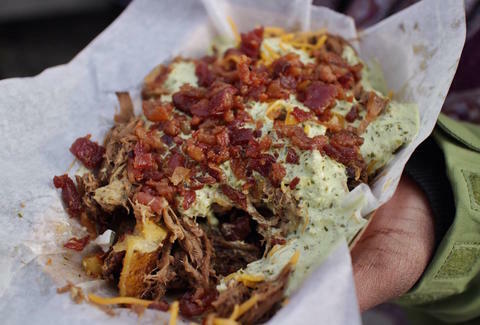 If she has to be involved in an auto accident in the A, Brook Bolen hopes it will involve one or more food trucks, Follow her @BrookBolen for more food-related musings.